Today we are going to talk about sled dragging and a very unique variation I came up with. Most anaerobic alactic / anaerobic lactic sports (especially combat athletics) require not only specific metabolic adaptations but a general conditioning foundation (GPP). It is this foundation that allows more specific, higher level conditioning to be implemented and developed. Sled dragging is an excellent tool to help develop this general conditioning baseline. and now a car tire! Hook the tow rope through the car tire and anchor it back onto the sled. Grab over the circumference of the tire and perform a tight chest crush. Now walk backwards. We also did a variation where we perform a strong rotation to move the sled. In the video I show another variation of holding lacrosse balls. This makes the chest crush even harder. In this new article I am going to discuss something that is of great importance. But first, something really cool. We cycle in this variation once in a while after the lifter / athlete demonstrates proficiency with horizontal and vertical pressing AND horizontal and vertical pulling (*Remember, we must create a balance in the volume of movements). As the lifter goes through the range of motion of the press there is a torque across their torso that is very significant and this must be stabilized. Once stabilized and braced and with the shoulder retracted and packed back, the lifter will begin their set. In the video you’ll hear me instruct John (the second athlete in the video) to switch hands on the press. During his set I am always observing, instructing and providing lifting cues for form. I saw his rep was slow and he was losing stability. Once I see this, I must immediately jump in and instruct him to switch hands or end the set if he has already lifted with both arms. NO GRINDING REPS. There is no need. In a fatigued set where the reps are grinded out, that is when injuries occur. Also, if every set is taken to this “failure”, overtraining is much more likely. We want to see quality reps and complete focus by the athlete. They must be “in” the set the entire time. As my good friend Rob Pilger says, “Fatigue makes cowards of men” and fatigue also puts the athlete into a compromising position. Do you let them grind the rep out in a bad movement pattern, or do you cut the set and get another rep on the next workout? My 20 years in the trenches advice? Cut the set. * Key Note: A neutral grip is preferred for athletes as this is the most advantageous and safest position. You have to see this testimonial for AMPED Warm-up. It is from Nicolas Amp (yeah I love his last name!) and it is awesome. Not only does he provide great feedback, he also sent me a picture of him watching AMPED in his car during a traffic jam! Check it out! When you think about speed, quickness and reactive movements you immediately think of jumps, agility drills, jumping and maybe even perhaps some overspeed running with bands? One of the biggest mistakes you’ll see in a strength program designed for athletes (or anyone for that matter) is the exclusion on unilateral lower body work. Of course the foundational compound movements like the bench, squat, deadlift, military press, power clean & press, pull-ups, etc. have to be there. But the supplemental work pulls everything together. Common lower body unilateral exercises include; lunges, step-ups, Bulgarian split squats, power skips, one leg glute bridges and one leg hip extensions on bench. In addition to building a well balanced program, unilateral lower body work will also reveal imbalances that are “masked” with conventional bilateral barbell work. Does the athlete shift left or right when performing lunges? Does the athlete fall forward during db step-ups? Everything you have the athlete do is a screening opportunity for you as a coach. Always be watching! barefoot – all done barefoot, highly recommended! In the article today, I will be showing you two advanced unilateral lower body exercises. Both should be done once the athlete demonstrates proficiency in their progressive transitional components. 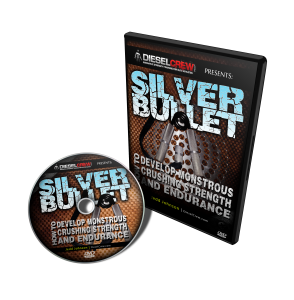 Copyright© 2010 The Diesel Crew, LLC. All rights reserved. Just got back from Fair Lawn, NJ for an exclusive interview with Martin Rooney. After training at the Parisi Speed School, Martin and I sat down for this 30+ minute interview done for Elitefts.com. It’s something of an honor to be asked to do a guest post for Smitty and Jedd, especially as I’ve been a big fan for some time. For people that don’t know, my name is Barry Gibson and I own and operate Grapplefit Training in Sunderland, England. 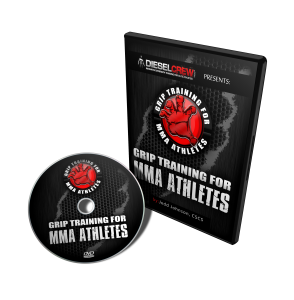 I have been the regular strength contributor to Fighters Only Magazine for almost four years now, and have had the concept of Grapplefit for at least seven years. Only now is it becoming a reality and I have my own unit where I train combat athletes full time. I also run fat loss boot camps for ladies and gents not involved in the fight game. One of my more recognizable clients is Ross Pearson – TUF season 9 lightweight winner and now UFC fighter. At the time of writing, Ross has just defeated Aaron Riley at UFC 105. Here are some examples of some in-season conditioning circuits for muscular, strength and power endurance. Get yourself a copy of the magazine for this month, or check it out online. The article comes with a pretty extensive workout program. In the magazine, I have a couple other small blurbs too! Here’s an example of an anaerobic conditioning circuit for a wrestler or combat athlete. The athletes will do as many reps as possible in the 30 second blocks and switch on the whistle. Each run is roughly 3:30 minutes. 3 minutes of resistance and :30 seconds of total rest which is the accumulated time to switch between exercises. Run through this circuit 3-5 runs, dependent upon the sport. Leave your comments – how does Dana’s form look? Any technique adjustments? 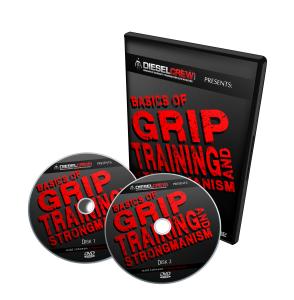 If you’ve been visiting Diesel for a while or read any of our articles, you know we’ve been hyping grip strength training for years. It is the endpoint of the kinetic chain and power is expressed through the hands. Training for his upcoming fight Jens Pulver hits us with a very innovative training tip for grip strength. Not only is Kimbo fighting James Thompson this weekend on primetime (CBS May 31 at 9-11 p.m. ET/PT) but Jens Pulver is fighting Urijah Faber at WEC 34 on June 1st. Thompson has his work cut out for him as Kimbo is steadily improving under the watchful eye of Bas Rutten. I remember watching Thompson, who has tons of energy and was very hyper in the ring, lose via a quick knockout to Fedor’s brother Aleksander, but since then he has gone on to a solid 14-8-0 record. Kimbo, at 2-0, is fighting to establish his legitimacy in the heavyweight ranks and at the same time, progressively picking his opponents as his skills develop. Kimbo has gone from a homeless guy, to youtube sensation to living his dreams. I think this fight is not only a great opportunity for both fighters, but also the sport of MMA. Being on prime time tv will continue to increase the exposure of a great sport. Faber, 20-1-0, is explosive, young and hungry. This is already his 5th title defense of the WEC Featherweight title. Jens is in need of a win and would love to get a title again. This will, without a doubt, be a quick, fast-paced fight – so don’t blink! Watch on June 1st on Versus. Special Note: At the 1:20 mark in the video, Jens talks about training his GRIP and how he hits harder than ever (notice the KB’s in the background). Leave your predictions in the comments section! Check out the pic of Kimbo above throwing the medicine ball around, check this out for more sick abdominal training exercises for athletes. UFC 84 – Make Your Predictions! Copy the following list and make a comment with your predictions for each fight! Rumor has it that a Kimbo vs. Tyson bout is a possibility. Kimbo first has to get through James “The Colossus” Thompson on May 31st. I last pics I saw of Tyson, he was about 300 lbs. That much weight on a 5′ 10″ frame isn’t a good thing for the former champ. Obviously the fight would be a publicity stunt and wouldn’t prove anything as far as Kimbo’s legitimacy, but I’m sure Tyson could use the money. I’ve been a Tyson fan since the beginning and think he was one of the top 5 heavyweights of all time, but Kimbo is in his prime right now (even though he is in his mid-30’s) and Tyson is far from his fighting weight. It wouldn’t make it out of the first round, Kimbo by KO.